Wild: Coelodonta utiliserro is a friendly herbivore, common to the tundra and grassland regions of the island. It is a large and dangerous creature, thought it seems fairly trusting of the fauna around it. Once attacked, Coelodonta charges towards its foe. It builds up momentum as it charges, and depending on its ultimate impact speed, the results can be terrifying. With enough room to charge, it can even skewer the largest creatures in just one single gore! Domesticated: When not being hunted for its horns, Coelodonta makes an excellent beast of burden. Its ability to take on far larger opponents provided sufficient charging room, as well as its sizable load capacity, make it a solid addition to any trader party or gathering expedition. 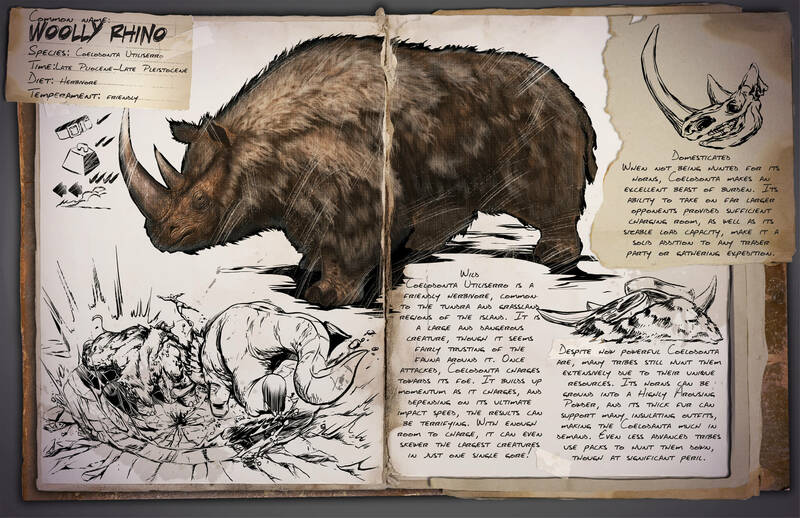 Known Information: Despite how powerful Coelodonta are, many tribes still hunt them extensively due to their unique resources. Its horns can be ground into a highly arousing powder, and its thick fur can support many insulating outfits, making the Coelodonta much in demand. Even less advanced tribes use packs to hunt them down, though at significant peril.